The diet of the trout is fairly wide ranging consisting of whatever is locally or seasonally available to them. They will hunt small shoaling fish such as minnows, they will relish worms and grubs dislodged by a swollen river but the staple diet of the trout is most commonly made up of insects in their various stages of life. It follows, then, that trout can be caught on a wide variety of natural baits and lures. They can be caught on a worm, minnow or other natural bait, methods requiring considerable skill for consistent success in all but spate conditions. 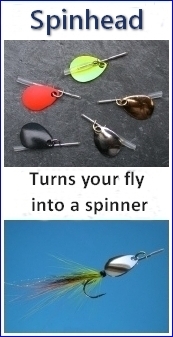 They may be caught on artificial spinning lures in a great variety of ingenious designs. But the method which holds the greatest general appeal, in offering the highest potential for enjoyment, challenge and interest is undoubtedly fly fishing. So let's take a brief look at the trout fishing tackle needed for fly fishing for wild brown trout in Scotland's lochs and rivers . The advent of carbon fibre as a rod making material has given the trout fly fisherman a great choice of highly efficient, and sometimes very expensive, fly rods, although it has not perhaps revolutionised his sport to the same extent as it has for the salmon fisherman. 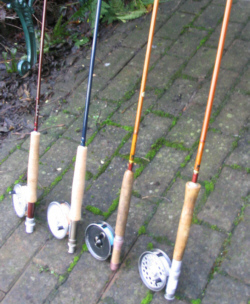 Indeed, many trout fishermen still have a great affection for the more traditional rods built from split cane, or even fibreglass, which, in the shorter lengths, can be very pleasant to fish with. His choice of rod will, of course, be dictated by the type of fishing, be it rolling a short line from a drifting boat, tripping a bob fly across a good wave on a highland loch, casting a delicate dry fly to the wary resident trout of our larger rivers or fishing a team of spiders down a rock strewn upland burn. The loch fisherman has traditionally favoured the longer rod, in lengths up to eleven feet or more. Similarly, the long rod might have found favour with those fishing a team of Clyde style wet flies, while the dry fly man would have gone for something shorter, perhaps eight or nine feet. Long rods in carbon fibre are now light enough to fish all day, without undue strain or fatigue and are still popular on the Scottish lochs. For river fishing, or fly fishing from a loch shore, there has been a general move towards a slightly shorter fly rod of perhaps nine or ten feet, casting a fairly light line. 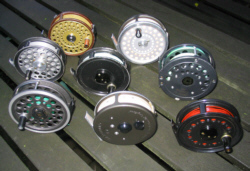 by both fly fishermen and collectors - reels like the Hardy Perfect, the Princess and the Marquis - or the solid fly reels made throughout much of the last century in Redditch by J.W. Young of Redditch, reels such as the Pridex and Beaudex, or the less expensive but eminently practical Rimfly reel, made, until very recently, in the south of England. Long gone are the days when a trout fisherman would have only one reel and one line, made of oil dressed silk, greased at the start of the day to make it float and carefully dried and redressed with grease before the next outing, or perhaps left partially or wholly untreated to fish as a sinking line. Today we have lines in all sizes, weights and profiles imaginable. We have double tapered lines, weight forward lines, floating lines, neutral and intermediate lines, slow, medium and fast sinking lines and, of course, we need a reel or spool for each one. Life is no longer simple for the trout fisherman, although it must be said that the new plastic lines are much more easily maintained and very practical. For our trout fishing here in Scotland, though, all that is needed throughout much of the season is a floating line, perhaps in a size 6, which will cope with most situations on loch or river. I prefer the simple practicality of a double tapered line, which is pleasant to handle, is more durable and generally more flexible in use than a weight forward line. Although it is quite conceivable today that your fly line may, if you are not careful, cost you more than your fly reel, there are many excellent fly lines available at reasonable cost from makers like Aircel, Cortland and Shakespeare, which, if properly cared for, will last many seasons.